Yesterday was the US holiday of Thanksgiving, meaning that the Weekly Report was published a day later than normally scheduled. Thanksgiving is one of the largest American holidays, and I feel that its (generally) secular celebration of gratitude and family helps bind our currently fractious people together more than other US holidays. Expressing gratitude is universal and has been shown to make people more satisfied with their lives, so I’m going to write this week’s WR in the form of things about Telos for which I am thankful. I’m thankful for our progress this week. It seems that the Telos flavor of IPFS (TIPFS) is going to be the first working implementation of this decentralized file storage technology, meaning that Telos will soon offer a new and valuable service to app developers not available on any other EOSIO chain. This development also means we will be able to resolve the few remaining governance contracts. These contracts are also very close to completion, so that we can vote to launch as soon as they are more fully tested. I’m thankful to the Telos community which has shown a lot of patience and understanding about our need to fully complete development before launching the network. We met on Tuesday November 20th to discuss a Go/No-go vote and agreed that there was no point in calling a vote at that time. We will meet again on Tuesday November 27th and many feel this date may be much more promising for a Go vote. We are closing down our processes to prepare for this. We understand how eager everyone is to get Telos off the ground — we are eager for this too — but for very good reasons we have promised not to launch until the code is ready and the community is sticking with us on this. Thank you! 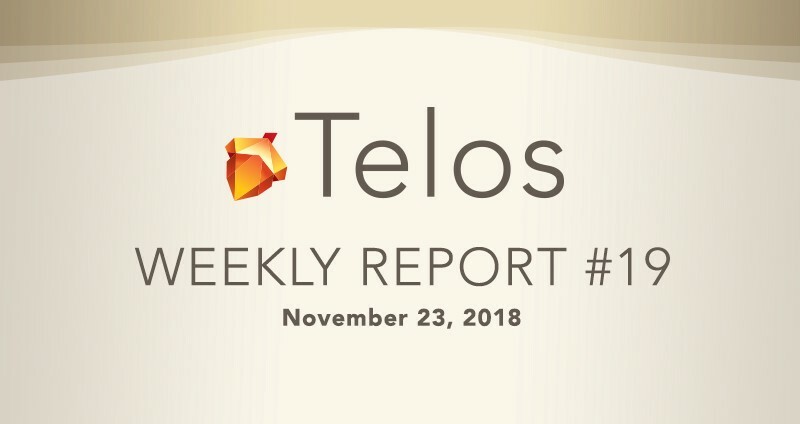 I’m thankful for how rapidly the Telos community is growing. New people have joined regularly and in the past week there has been a very large influx of well known and respected EOS block producers who are publicly announcing that they are joining the Telos testnet with the intention of being Telos BPs. These included EOS Dublin, EOS Nairobi, EOS Germany, EOS Mediterranean, and others. I’m very thankful for the members of the Telos Launch Group who continue to work tirelessly towards not only the launch of the Telos chain, but also its ongoing growth and success. I find it quite noteworthy that in 2018 it is still possible to launch a blockchain project of major prominence without any ICO, token sale, or major private equity stake. The TLG members are very close to pulling off the type of project that the crypto community rarely sees anymore. And it has all been done with a great community spirit and collegial cooperation across a wide array of fields. Finally, I’m very thankful for my own family’s understanding of the long hours over many months that have been required to build Telos over the compressed period of time that was necessary to keep Telos at the forefront. I know that other TLG contributors’ families have also sacrificed much time with their loved ones so that we could accomplish what we have so far and I am thankful for their understanding and support as well. A new code release is being completed by the development team and will be tested on a new Stagenet for at least 24 hours prior to testnet implementation. This new code is a possible release candidate for the Telos mainnet launch, pending testing. The testnet rotation script for block producers has been working smoothly, and block producers have been successfully recording log runs on AlohaEOS’s block producer benchmark platform. The Telos Launch Group met on November 20th, 2018 to discuss a Go/ No-go vote. Following discussion, no call for a vote was called and seconded. Instead, the group decided to reconvene on Tuesday November 27th for a new voting opportunity. This was largely due to the need for IPFS to be more fully implemented and tested so that the contracts dependent on it could be fully developed and tested. Once the development team completes the leaderboard and election voting systems and approves IPFS, then the remaining contracts (Worker Proposal, Trail Service, Ratify Amend, Arbitration) will be ready for mainnet. As the EOSIO community learns about the many advantages of Telos, More DApp developers and block producers are choosing to deploy on the Telos Blockchain Network. EOS Dublin was among the first to announce this week that they will also become block producer candidates on Telos and are in the process of joining the Telos testnet. EOS Dublin will still be a backup BP on the EOS mainnet, an active BP on Worbli. Other notable EOS block producers announcing their intentions to become Telos BPs in the immediate future include EOS Nairobi, EOS Germany, EOS Mediterranean, and AtticLab. The development team has been writing unit tests for both the system contract and the eosio.trail voting contract. The development team then discovered that the voting contract did not support the type of voting required for the TVT Voting system and Arbitration system. This development of a more robust eosio.trail contract is nearing completion and is moving into testing. Once the eosio.trail contract unit tests are completed, the development team will then create the leaderboard voting system and the election system. The Interplanetary File System (IPFS) is a decentralized storage technology that uses hash values to achieve data immutability and deduplication. IPFS data distribution is similar to HTTP, but it follows a peer-to-peer protocol that powers faster transactions and more resilient networks. Telos will be deploying network-wide IPFS storage to expand the network’s storage capacity, leading the way for adoption by other EOSIO chains. Governance contracts such as the Worker Proposal System and Ratify/Amend, etc will also require IPFS in order to be deployed. This week Stephanie Sunshine (GoodBlock) and John Hauge (Telos Voyager) continued testing the system’s pub/sub messaging pattern, which will enable serverless communication between independent applications on the Telos network. The team is no longer managing the pin set of test nodes with an IPFS cluster, and is instead using just the built in swarm and a custom pin sync scripts. The Telos Launch Group (TLG) voted to adopt recommended changes to the Telos Blockchain Network Operating Agreement (TBNOA) with a vote of: Yes — 35, Abstain — 0, No — 0. The TLG Governance Working Group proposed to amend TBNOA clause 14 and clause 38. The changes to the TBNOA involved unifying the voting period for all types of elections (WPS proposals, ratify/amend proposals, and WPS proposals) to 5,000,000 blocks (approximately 29 days) in order to simplify the voting system, ensure that voters will be able to vote on all issues they care to, and further reduce the gameability of Telos voting. The motion also called to approve creating accounts for all EOS mainnet launch BPs who had joined within the first 30 days in order to allow them to easily join Telos as block producers in the future and prevent others from attempting to confuse voters by adopting their names, and also to shorten the Telos Foundation first Board election to 520,000 blocks. Several more key Telos governance documents have been translated in order to expand the Telos community. Governance documents have been translated into Chinese and Korean, and the whitepaper is now available in Portuguese. A Telos community member has translated the whitepaper into French, which will also soon be available on the Telos Foundation website.